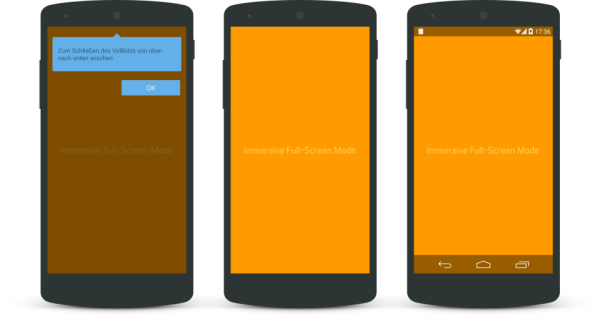 Please note that the immersive full-screen mode was introduced with Android™ 4.4 (API Level 19). Hence enabling the mode will only have effect on devices with Android™ 4.4 or higher. The system displays a reminder bubble the first time users enter immersive mode and reminds users how to display the system bars. Your app is displayed full screen without status bar and navigation bar. The usable screen size for your app increases to the actual screen size of the display allowing you to take advantage of every pixel on your screen (e.g. to 1920x1080 instead of 1794x1080 on a Nexus 5). An inward swipe in the system bars areas causes the bars to temporarily appear in a semi-transparent state. The bars automatically hide again after a short delay, or if the user interacts with the middle of the screen. The app content appears behind the system bars, so that the content doesn't resize as the system bars hide and show. If both modes are enabled, immersive full-screen mode will prevail. This means that you will see the immersive full-screen mode on devices with Android™ 4.4 or higher and the low profile mode on devices with Android™ version greater or equal 4.0 and lesser 4.4. An even easier way to enable the immersive full-screen mode is the use of the Dashboard and the Android / Configure Project command. 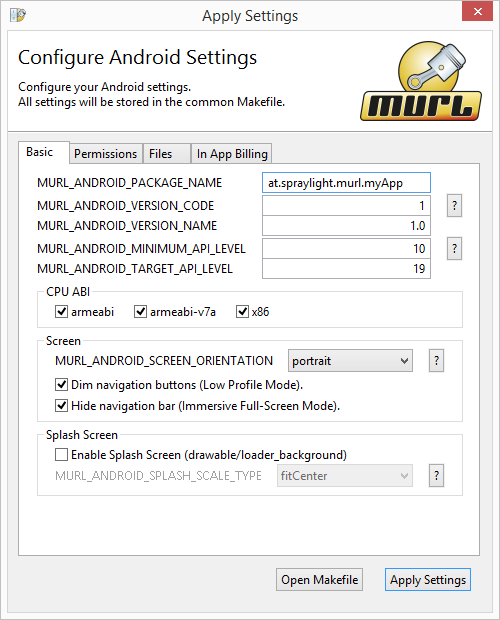 The command will open a dialog window, where you can conveniently specify the most important Android™ settings including the desired screen mode. All changes made in the dialog will then be applied to the common Makefile. You have to rebuild the Manifest file to apply the changes (delete Manifest file and start gradle sync). 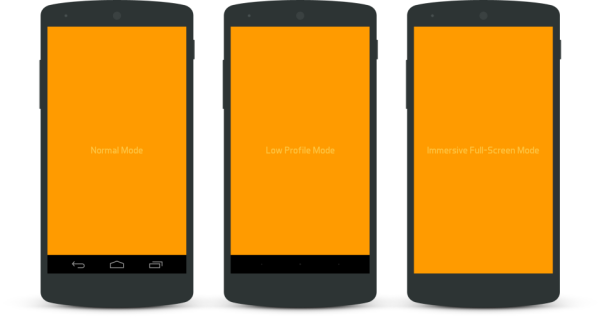 Further information about the screen modes can be found in the section Managing the System UI of the Android™ developer documentation.